Facial paralysis occurs when there is complete paralysis of all or some muscles responsible for our movements and facial expressions. The nerve that controls the muscles of the face is called the facial nerve. In this paper we explain the facial paralysis, with emphasis on Bell's palsy, which is the most common cause. 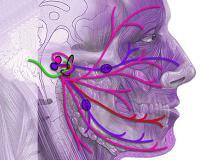 To understand the facial paralysis it is important to understand the anatomy and functions of the facial nerve. Read carefully the following paragraphs, I'll try to describe the facial nerve in the simplest possible way. Our body has 12 pairs of cranial nerves. They are the nerves that born in the central nervous system (brain) and follow to the head and neck without passing through the spinal cord. As an example of cranial nerves, we can take the optic nerve that transmits images from the eye to the brain and the olfactory nerve that does the same with the odors detected by the nose. The facial nerve is one of 12 pairs of cranial nerves. We say pairs, as for each nerve head comprises two nerves arising in one side of the brain, addressing each to one side of the skull. Briefly we can say that the facial nerve is responsible for the movements of facial expression, sense of taste in anterior 2/3 of the tongue, and participates in the secretion of saliva, tears and innervation of the eardrum. As mentioned above, each of the facial nerve springs on one side of the brain, before reaching the face, a portion of each crossing of nerve side, going to innervate the contralateral side. This anatomical detail explains why nerve damage in the brain called the central peripheral nerve injury, causes a type of facial paralysis, while the lesion occurring after facial nerve has already left the brain is called the peripheral injury facial nerve (the difference will be explained when talking about the diagnosis). The illustration above shows in detail the anatomy of the facial nerve. For non-health care it is not necessary to understand how this difference occurs between central and peripheral lesions of the facial nerve. It is complex and not worth losing time explaining these details. Let's move on. As have been already mentioned, facial paralysis may be central, as in cases of stroke, or peripheral, as in trauma and viral infections. Facial paralysis is an event that causes great anxiety in the patient and their family members, because the first thing that comes to mind is the possibility of a stroke (CVA). However, more than 70% of the facial paralysis occurs due to a more benign disease as well, called Bell's palsy. It is it that we'll talk about in the next lines. The Bell's palsy only in the U.S. alone affects about 40,000 patients per year. It is a very common disease, though little known, can affect any gender, ethnicity or age, however, is rare before the age of 15. Bell's palsy is a facial paralysis caused by herpes simplex virus, the same that causes cold sores and genital famous. This virus can attack the facial nerve causing it to inflame and swell, becoming compressed within the skull, and thus reducing its ability to transmit nerve impulses. In addition to herpes simplex virus, other viruses can also cause the facial nerve paralysis, for example, the herpes zoster virus, which causes chickenpox (varicella) and shingles, Epstein Barr virus that causes mononucleosis and cytomegalovirus. Facial paralysis caused by herpes zoster virus is called Ramsay Hunt syndrome, usually causing pain and blistering of the face. 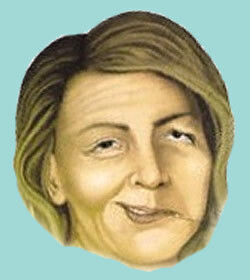 Among the risk factors for Bell's palsy are pregnancy in the 3rd quarter and diabetes mellitus. The Bell's palsy is a facial paralysis, i.e., affects the facial nerve after it has already left the brain. Bell's palsy begins abruptly, with paralysis of the entire half of the face (hemi facial paralysis) that evolves in a few hours. The most characteristic symptom of Bell's palsy is the loss of expression in half of the face with an inability to fully close the eyes, raising an eyebrow, a frown and smile. 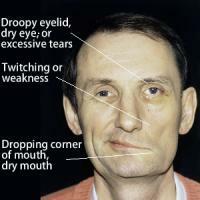 The next pictures illustrate the main signs of facial paralysis. In addition to the signs of paralysis of the muscles of a hemiface, other symptoms usually appear as a decrease in the tearing of the eyes, increased sensitivity to sound in one ear, reduced sense of taste in two thirds of the tongue, decreased salivation and headache or pain around the jaw. Despite the concern that a case of facial paralysis can arise in the patient and family, Bell's palsy usually regresses spontaneously. However, where more aggressive, there may be sequelae. Patients typically recover fully are those with signs of regression of the symptoms during the first three weeks. The lower the severity of paralysis, the greater is the chance of full recovery. If the patient has all the symptoms described above and does not show improvement after 21 days, there is a risk to stay with sequelae. Even without treatment, about 70% of patients recover completely, but if the improvement usually appears within 3 weeks, complete recovery may take up to four months. About 7% of cases may recur within a 10-year interval, 3% of patients have more than one recurrence, with 3-4 episodes of facial paralysis in this same space of time. The diagnosis of Bell's palsy is usually clinical and exclusive, that is done only after excluding other causes, such as tumors that may be compressing the facial nerve and Bell's palsy affecting mimicking. Facial paralysis of stroke is different because it is a central paralysis that occurs due to ischemia of the nerve within the brain. While a peripheral paralysis affects all hemiface, paralysis spares the central upper region of the forehead and eyes. In addition, stroke is often associated with other signs such as paralysis in the rest of the body, disorientation, difficulty walking, etc. Acutely, the most important is care for the eyes. As the patient with peripheral facial paralysis usually cannot close their eyes and may have reduced tear production, they can become dry, with a risk of blindness from corneal injury. Eye drops with artificial tears during the day and eye protection at night, during sleep, are important for protection of vision until the eyelid movements return to normal state. Despite improvement in most instances spontaneously, recent work has shown that the use of corticosteroids increases the chance of complete recovery. The currently proposed scheme is 60-80 mg of prednisone orally per day for a week. Treatment should be started within the first 3 days. 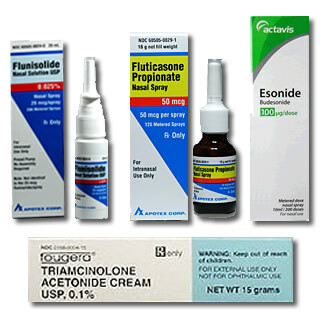 Although the majority of facial paralysis are caused by viruses, it has not been fully able to prove the benefit of the use of antivirals for the treatment of these cases yet; however, some groups use this type of drug with corticosteroids. The most widely used is the antiviral Valaciclovir.